A Black Forest Decor Exclusive - Featuring rustic wildlife and animal track prints, this quality glassware is perfect for all your lodge gatherings. Dishwasher safe. Made in the USA.� Allow 1 to 2 weeks. A Black Forest Decor Exclusive - Black bear images and paw prints on the Black Bear Double Old Fashioned Glasses bring outdoor style to your home bar. Dishwasher safe. Made in the USA. Set of four measure 3"Dia. x 4�"H; 14 oz. each. ~ Allow 1 week. A Black Forest Decor Exclusive - Black bear images and paw prints on the Black Bear Iced Tea Glasses bring outdoor style to your home bar. Dishwasher safe. Made in the USA. Set of four measure 3�"Dia. x 6�"H; 20 oz. each. ~ Allow 1 week. A Black Forest Decor Exclusive - This quality glassware with a moose design and hoof track accents on the rims is perfect for your lodge gatherings. Dishwasher safe. Made in the USA. 3 1/2"Dia. x 4 1/4"H each. Allow 1 to 2 weeks. 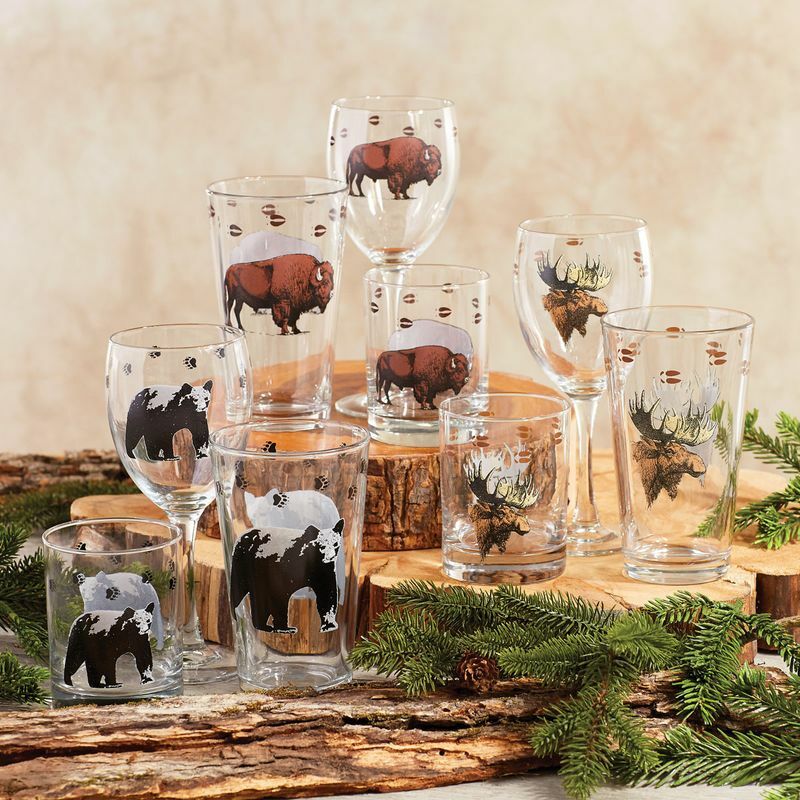 A Black Forest Decor Exclusive - This quality glassware with a bison design and hoof track accents on the rims is perfect for your lodge gatherings. Dishwasher safe. Made in the USA. 3 1/2"Dia. x 4 1/4"H each. Allow 1 to 2 weeks. A Black Forest Decor Exclusive - This quality glassware with a bison design and hoof track accents on the rims is perfect for your lodge gatherings. Dishwasher safe. Made in the USA. 3 3/4"Dia. x 6 1/4"H each. Allow 1 to 2 weeks. A Black Forest Decor Exclusive - This quality glassware with a bison design and hoof track accents on the rims is perfect for your lodge gatherings. Dishwasher safe. Made in the USA. 3"Dia. x 8"H each. Allow 1 to 2 weeks.